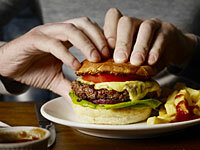 MONDAY, April 16, 2012 (Health.com) — It's no secret that fast-food fare like burgers, french fries, and fried chicken tends to be high in sodium. According to a new study, however, American fast-food customers may be getting a larger dose of sodium than their counterparts in other countries—even if they order the exact same items off the menu. Overall, the researchers found, fast food tended to be saltier in the United States than in the other countries included in the study: Australia, Canada, France, New Zealand, and the U.K. What's more, the sodium content of the same menu items at the same chains varied by country, sometimes widely. But in some cases the difference was dramatic. The Chicken McNuggets sold in the United States contained 2.5 times more sodium than the McNuggets sold in the U.K. Likewise, the sodium content of a Subway club sandwich was more than twice as high in the United States as it was in France. Consuming too much sodium can raise blood pressure and contribute to hypertension, one of the leading risk factors for cardiovascular disease. In recent years, public health officials across the globe—including those in the U.K., Brazil, and New York City—have set voluntary salt-reduction targets for food companies. In the U.K., the government's push to reduce sodium began in earnest in 2006, and the relatively low sodium levels seen at U.K. restaurants in the study suggests the initiative may be working, says Gary Beauchamp, Ph.D., director of the Monell Chemical Senses Center, a nonprofit institute in Philadelphia that specializes in taste research. Salt has a number of properties besides taste enhancement that make it attractive to food manufacturers. Sodium is a preservative, and it also can also make certain foods easier to process. "Salt is the magic ingredient—it does all sorts of things to food," Beauchamp says.